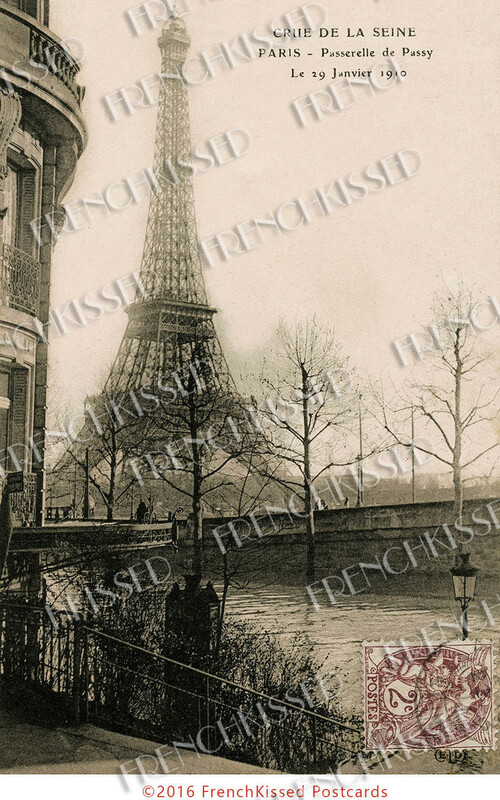 This digital download is of a rare French postcard mailed in 1911. It is a photo of the overflow of the Seine at the Passy footbridge. In Paris in 1910, the Seine flooded big time! Streets were covered with water and impassable; many impromptu boardwalks were set up. In this picture, there's none of the drama of the flooding, but instead just a very sublime scene rich in architectural detail. At 1200 dpi, this digital can be printed for wall art, into poster size [up to around 24 inches wide or so]! Embedded copyright. This scan is for personal use or commercial resell in PRINT form only. Commission- and royalty-free. Also available and listed separately. Just WAIT about 3-5 minutes and you will receive an email with the download link for Photo No.1 about 3.5 by 5.5 inches at 1200 dpi.